I did something like this coming through Atlanta alone several years ago. Except instead of what this guy did or having a mannequin, I used a pillow wearing my leather jacket and I went the whole way through the high-occupancy lane with my left hand on the wheel and my right one holding the pillow up and in sight. How I cleared Atlanta while doing that, I'll never know. FIFE, Wash. (AP) — A Washington State Patrol trooper says it’s by far the best carpool scam he’s seen, but it didn’t work. A motorcycle trooper parked along Interstate 5 near Tacoma on Monday afternoon spotted a driver and a rather unusual “passenger” pass by him in the carpool lane. 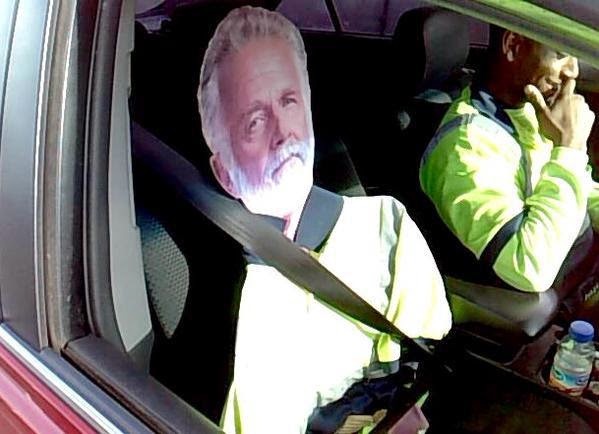 When the trooper stopped the car, he discovered the “passenger” was a cardboard cutout of the actor who portrays “The Most Interesting Man in the World” in Dos Equis beer ads. The highway patrol didn't confiscate The Most Interesting Man in the World, but they did tell the driver to not use him again. Later on the patrolman tweeted: "I don’t always violate the HOV lane law … but when I do, I get a $124 ticket." I love stories like this. You have to give this guy props for some ingenuity even if it didn't work. And hey, from the photo above it looks like he's still having a good time despite the error of his ways. Do you think that's an ethical thing to do? I think it's wrong for a cop to tweet about a ticket he's given. Me and my silly privacy demands!